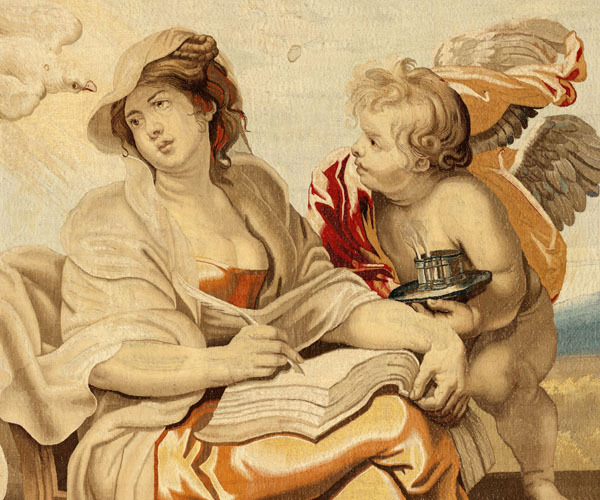 Between 1625 and 1626, the Archduchess Isabella Clara Eugenia commissioned her court painter, Peter Paul Rubens, to produce the models for a series of tapestries intended to decorate the church at the Monastery of the Descalzas Reales. They were to be used in particular at the beginning of celebrations related to the Eucharist, such as the Octave of Corpus Christi and the Offices of Good Friday, which included the celebration of the unique procession of Christ Reclining. 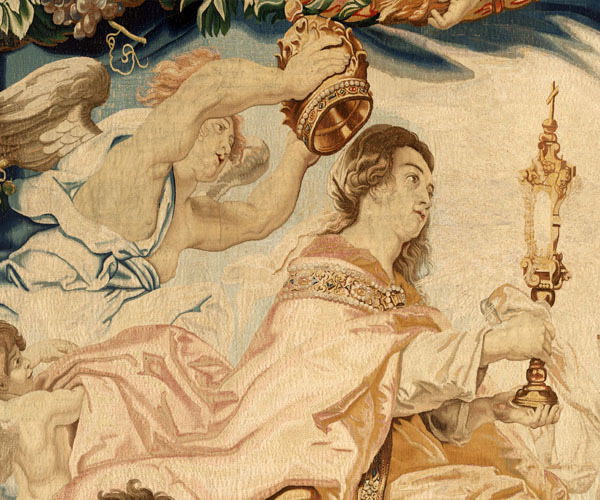 The twenty tapestries which make up the series show scenes related to the Sacrament of the Eucharist, a topic closely linked to the Counter-Reformation, and the iconography complies with the typical style of Baroque art. The tapestries were weaved in the workshops of Jan II Raes, Jacob I Geubels, Hans Vervoert and Jacques Fobert, all of whom were famous weavers in Brussels. It is one of the most important religious series created in Flanders during the first half of the seventeenth century, both for its quality and its scope. From the moment it was created it became an object of admiration, and from early dates several copies of certain panels were created as, for example, those displayed in Oncala (Soria). A gift for the Descalzas Reales. 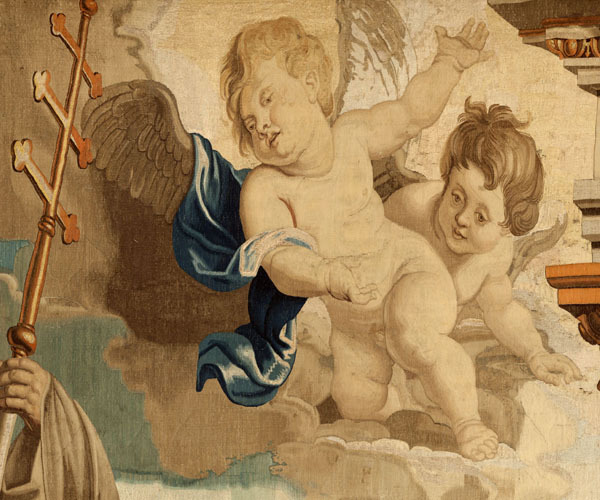 The victory of the Spanish in Pavia, in June 1525, is considered to be the motive for Isabella Clara Eugenia’s decision to commission this series of tapestries, as a votive offering which she conceived as a gift for the Monastery of the Descalzas Reales. The Archduchess had spent periods in the monastery as a young child and adolescent. 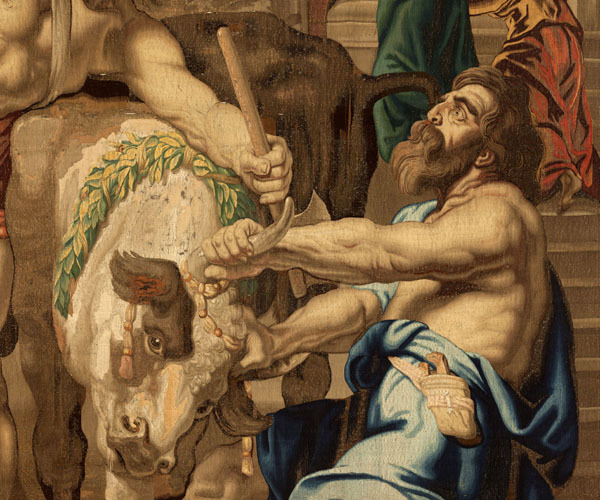 Rubens meticulously designed and redesigned the scenes of each tapestry while also creating a united ensemble. The creative process was made up of at least three stages: the first sketches intended to show the Archduchess what the final result would look like; the models, where the compositions are more defined and more detailed; and finally the cartoons, paintings of the same size as the tapestries which served as references for the weavers. The series was conceived as a decorative ensemble, with each tapestry destined to a particular place. The tapestries covered the walls of the church and were arranged on two levels. 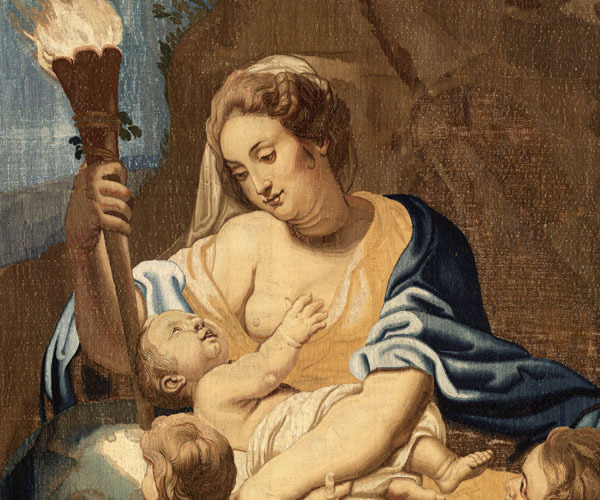 To connect the different scenes, Rubens designed a structure of columns and arquitraves, which replaces the traditional border in most of the panels. In some of them he also employed the technique of a “false tapestry”, giving a greater sense of movement to the compositions. These new techniques allowed him to connect all the panels and create harmony in the design. The twenty panels of the series are structured in various groups according to their content and iconography. 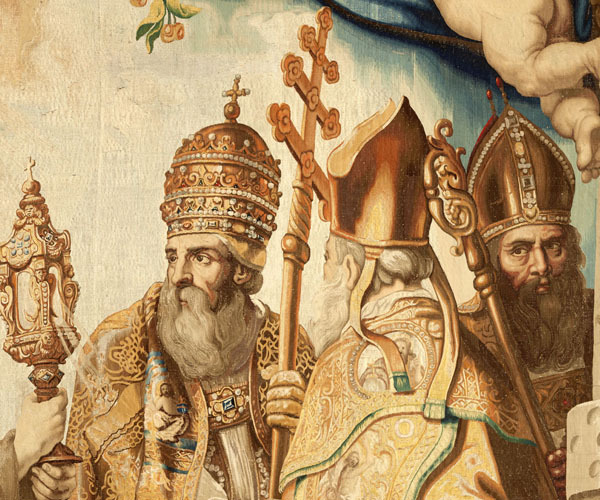 Three of them depict triumphal carriages, belonging to the Church, Faith, and Divine Love; another two form a procession with the Evangelists and the Holy Defenders of the Eucharist. 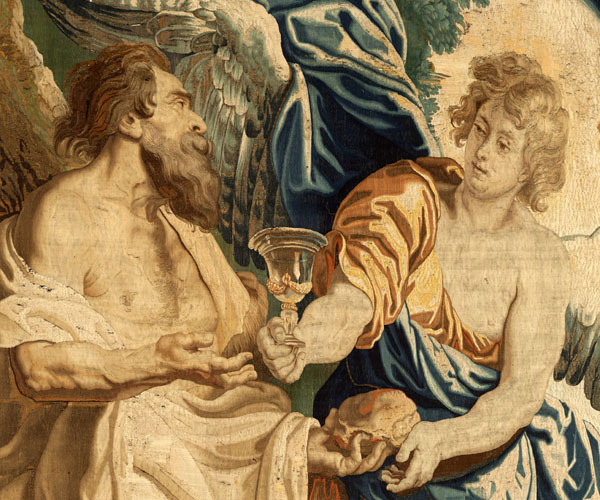 Two more show scenes related to the victory of the Catholic Church over heresy and pagan sacrifices, and there are four which depict episodes prefiguring the Eucharist (Manna in the Desert, Elias and the Angel, the Meeting between Abraham and Melchisedech and the Sacrifices of Mosaic Law). The five next tapestries make up an ensemble in the form of a retable, where the Adoration of the Eucharist is depicted through civil and ecclesiastical ranks. 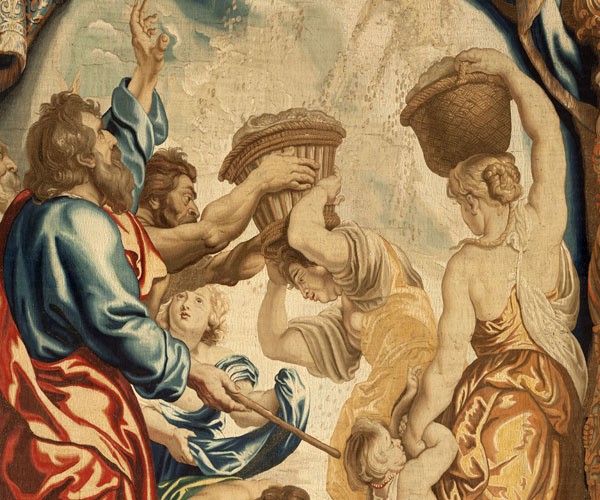 The final four tapestries were seemingly destined to decorate the church in specific places: three have allegorical themes, and the last one shows King David playing the harp. Since 1970, part of the series has been on permanent display in the Hall of Tapestries, the old sleeping quarters of the religious community. Currently, eleven of the tapestries can be seen, with the nine others remaining in storage in the monastery. However, they are displayed in the cloister of the church every year during Holy Week. E. Tormo, En las Descalzas Reales de Madrid. Los tapices: La Apoteosis Eucarística de Rubens, Madrid, 1945. N. de Poorter, The Eucharist Series (Corpus Rubenianum Ludwig Burchard, II), 2 vols, Londres, 1978. C. Scribner, The Triumph of the Eucharist. Tapestries designed by Rubens, UMI Research Press, Michigan, 1982.